The new AGO is a usability nightmare. Part Deux. 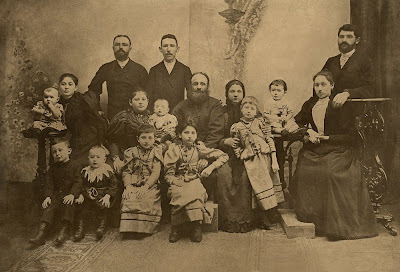 This is a family photo ca. 1900. It was preserved in poor condition and got torn and stained by cockroaches or other insects. The photo was about 10x16", too big for my scanner. I had to scan it in parts and then stitch in Photoshop. The Digital ICE did good job in removing cracks, but screwed up some other areas – it doesn't work properly with opaque and monochrome images. I had to scan it again without ICE and use parts of that image to cover ICE's errors. Here is the restored picture. Apart from some corner unsharpness, those large glass negatives captured very good detail (check out the grandpa's beard!). It shows that sensor size does really matter! The second picture was a pencil drawing cracked so badly that ICE and usual small brush cloning technique were useless. I took a large soft cloning brush and actually "painted" the whole image trying to preserve pencil texture wherever possible. Thanks for the interesting link! 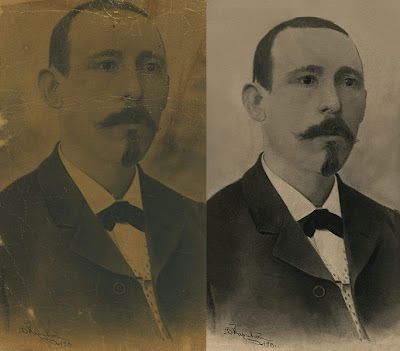 I want do do something similar, but concentrate more on restoration rather than just scanning and backing up. 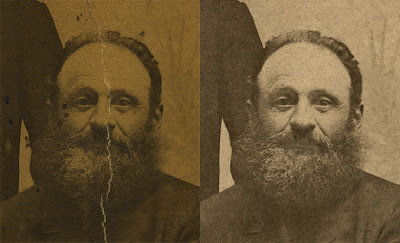 I'm working on my web page about photo restoration where there will be a gallery of pictures like these. May I ask what kind of project did you do with them?